Anthony used a modified version of that composition in his VJ set at Sónar 2015. He traveled from his home city of Santiago, Chile to Barcelona, Spain for the three-day festival of music, creativity, and technology. For his performance at Sónar, Anthony teamed up with another Santiago artist, DJ Raff. 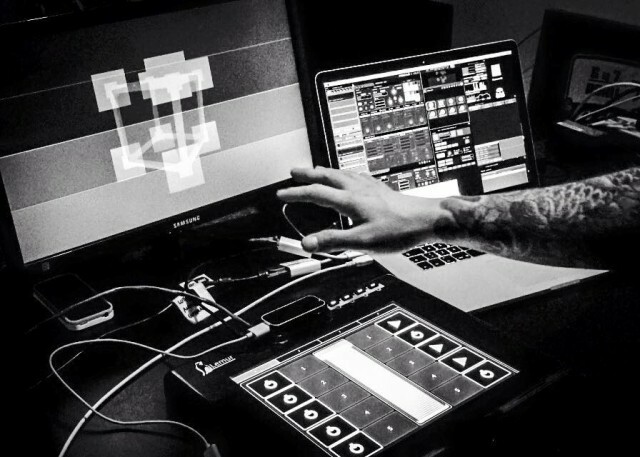 For Sónar, Anthony added Syphon output to his gallery composition so he could hook it into the rest of his VJ setup, which included Modul8 and Mad Eq. Not only does the composition look cool, it's also a great example of the Vuo community building on each other's work. At the heart of the composition is a particle emitter node by VJ SATOSHI. I talked to Anthony by email about his experience VJing at Sónar, his process for learning Vuo, and his projects in the works. How did you get started VJing? Working as a roadie on tour many years ago, I was with a band and they wanted to integrate video content for their show, but there was no more money to bring a VJ on tour, so I took the challenge to work doing both jobs. That was many years ago. Tell me about Sónar. Who were you performing with? What was the venue like? DJ Raff is on the turntables and I am the one behind the Mac. The crowd was really cool. After the set some people came up to us and asked about the setup, what we used for the VJ set. The venue is awesome as Sónar+D is the international conference organized by Sónar that covers the digital transformation of the creative industry to develop and strengthen talent, exchange knowledge and establish business opportunities. What was your technical setup for the performance at Sónar? I used Vuo 1.1 with Syphon output + Mad Eq 1.0 Syphon output + Leap Motion connected to Vuo composition + Modul8 Syphon input VJ mixer all connected to a Lemur MIDI Controller. The day after you bought Vuo, you posted your first composition to the gallery. A few weeks after that, you were using Vuo in your performance at Sónar. What was your process for learning Vuo? 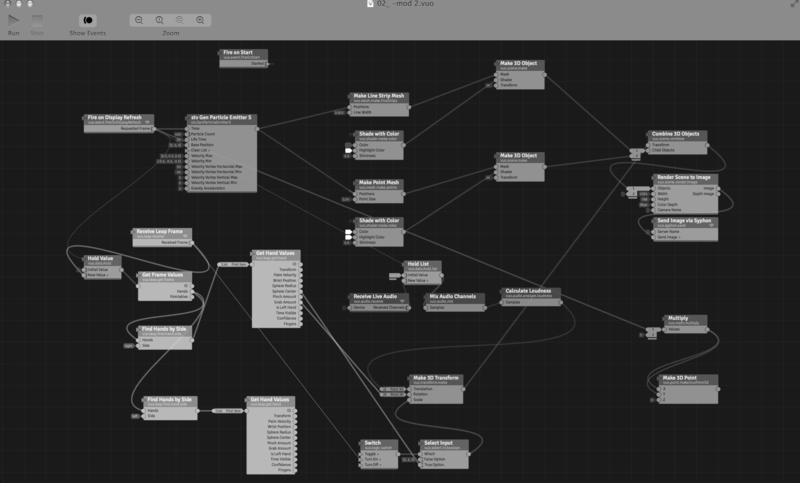 Quartz Composer was the reason I was able to start to work with Vuo. I was searching for some Quartz plugins and on the Kineme site I saw a post about Vuo, then I realized that there was a new option for Quartz Composer. I was very surprised when I read all that Vuo has to offer and also the community behind Vuo. I am still in the learning process with Vuo, hope to post more compositions as I will spend endless hours working on Vuo, trying to achieve interesting results for all our shows that we work with my partner JC Cumplido at Cronic Studio. What other projects are you working on? Any thoughts on how Vuo fits into your plans for the future? I have many plans for Vuo especially soon there will be a Vuo 1.2 update, so I am currently working on a Event for Miller Genuine Draft here in Santiago, Chile, and I am going to use Vuo with Leap Motion. Lollapalooza Chile 2016, definitely we will use Vuo connected to our video setup as we design Perry's Stage and fill the stage with video. I have included some pictures of the stage design of our last design. Sonar Sound Santiago, I will start to work on something more elaborate and complex. I have seen lots of the work the Vuo Community is working on that is very interesting, like VJ Satoshi Kanata, who I am a fan already of his work, also Martinus Magneson, George Toledo, Bodysoulspirit, Steve Mokris, and of course Jaymie Strecker. Could you explain feedback loops in Vuo?